This is just a guess, but tweeting the exact same thing from multiple accounts is probably not the best way to do hyper local journalism. As you can see, the tweet “It’s lunch time! 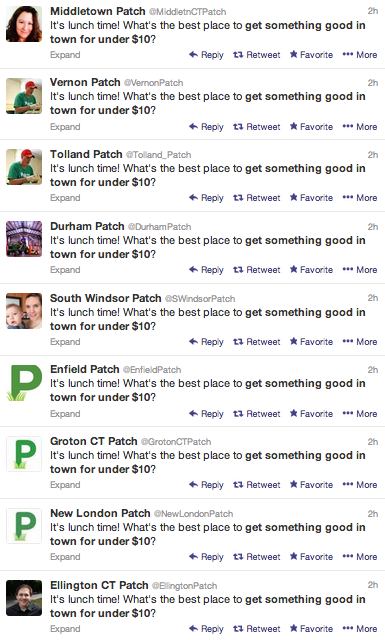 What’s the best place to get something good in town for under $10?” was sent out by several Connecticut Patch sites simultaneously. The local news site has had plenty of critics, and this will likely only fuel their fire. Please note that we’re not attacking the question. Locating an affordable, high quality lunch spot is extremely important. Especially, we presume, in Connecticut.